Celsius Library and the Gate of August. The Library of Celsius was constructed by the Consul Gaius Julius Aquila in the beginning in 117 AD as a Heroum (the tomb of a hero) for the Governor Celsius Polemaenus of the Roman province of Asia. The building was completed in 135 AD. Papyrus rolls were arranged in the niches on the inside walls of the library. In the front of the two-story building stand four female statues, personifying Wisdom, Knowledge, Destiny and Intelligence. In the picture at right are two of these statues, which are copies of the originals that are located in Vienna, Austria. The Consul Gaius Julius Aquila in memory of her father Julius Celsus Polemaeanus, who was buried there, built it towards 135. 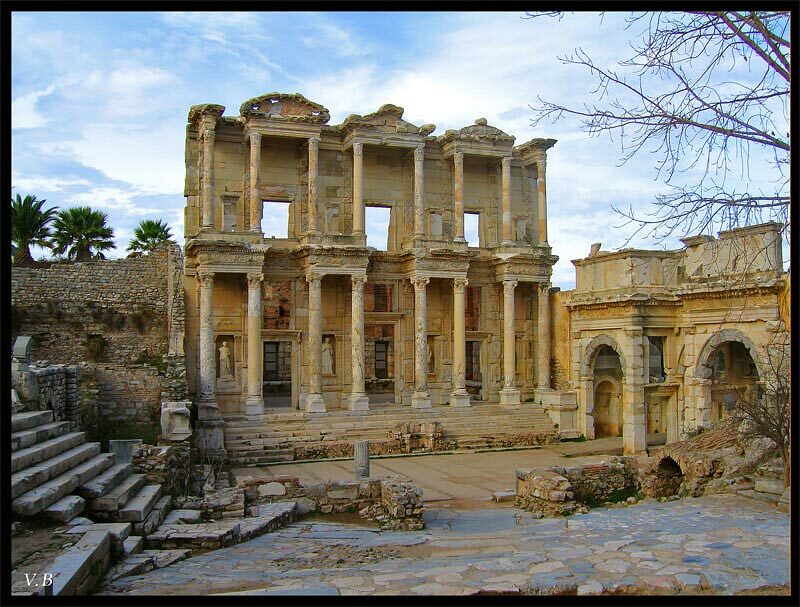 The library of Celsius is one of the principal monuments of Ephesus whose work of restoration is completed. It would have contained nearly 12000 volumes, distributed in niches along the walls, on shelves or in pieces of furniture. Centigrade was buried in a sarcophagus placed in the funerary vault, which is below the central niche of the room of reading. This sarcophagus is cut in a marble of quality and it is decorated low relief’s representing Eros. During excavations of 1904, one opened the lid of the sarcophagus and one found the skeleton of Centigrade locked up in a second sarcophagus out of lead, which was placed inside the first.